A Festival special Spiced Rum Ale that started as a joke! 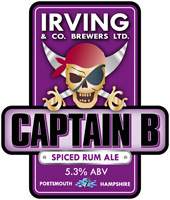 “I will NEVER do a beer called Captain B*********!” said Malc,.. er’ this strong sweet and spicy taste of the Caribbean proves otherwise. Flavours of Cinnamon and Vanilla dominate with dark sugar notes.